More easily manage your maps. CLIMB now lets you create folders, preview maps in your map list, and instantly share maps with friends and colleagues. Release your maps to the world! 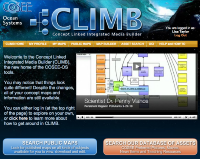 CLIMB now includes publishing options. View maps created by others on a wide variety of subjects. Published maps (vetted by COSEE-OS staff) are searchable, sortable, and available for copying to your profile for use by you. Make concept maps faster! No more "shift-click" to change concepts - simply click once on an object in the map builder to open its options. Also, snapped arrows now automatically attach to concept edges. View and present your maps in style! Resize your windows as large as you want, toggle concepts on and off, and dynamically zoom your maps for optimum presentation. Access thousands of educational assets, including videos, images, news articles, and resources. Want to explain the water cycle, but don't want to create a map? Our database is now easier to search. Find something you like? Save it in your own asset library. User names and passwords for existing users will not change, and all of your maps and profile information will be accessible to you when you log in to CLIMB.